What is the secret of the fogou? Can the moor be haunted by a demonic host of imps? And what is Brigadier Lethbridge-Stewart doing in Pengriffen? Teaming up with his old friend, the Doctor realises that an ancient conflict is nearing its conclusion – and Lanyon Moor is set to be the final battleground. Colin Baker is the Doctor in…The Spectre of Lanyon Moor. Remember Pyramids of Mars? Terrors of the Autons? How about The Talons of Weng-Chiang or The Hand of Fear? Sometimes, people forget that Doctor Who can be downright creepy and unsettling. Sure, the modern day episodes have their classics, such as Blink or The Empty Child, but few people did horror and terror better than Robert Holmes and Phillip Hinchcliffe. The two men channeled Hammer Horror’s style and ambiance into their stories, creating some classics that had none other than moral avenger Mary Whitehouse up in arms. The Spectre of Lanyon Moor is a direct throwback to those classic serials. In a desolate Cornish landscape lie ruins and mounds steeped in myth and legend. A mansion sits on a hill, where its owner funds an archaeological dig focused on excavating these ruins. At night, giggling and laughter can be heard through the mists. And through it all, two men who have met in the past in the past find themselves crossing paths again, even as one of them is seeing the other for the first time! I’ll come right out and say it. 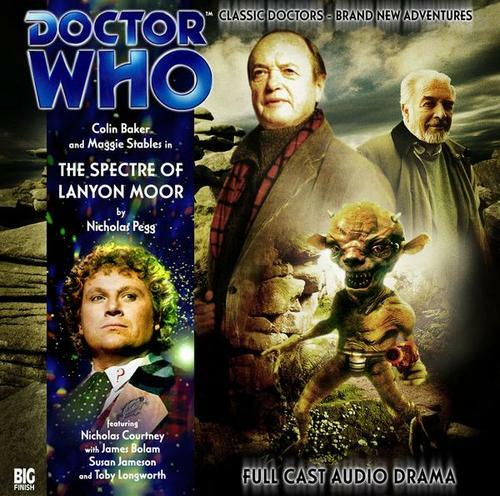 The Spectre of Lanyon Moor is an excellent offering from Big Finish. 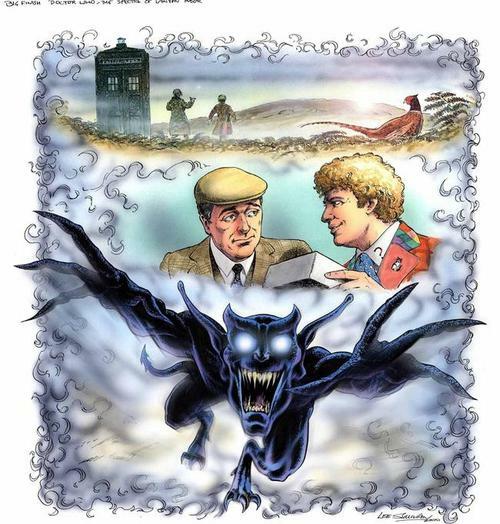 A solid story with a tight script, great acting from a talented cast, amazing sound and music, and the first meeting of the Brigadier and the Sixth Doctor all combine for a story that comes highly recommended! The opening of the first episode lays out the premise. 18,000 years ago, an alien scavenger was abandoned on Earth after being attacked by local predator. Fast-forward to the present day, where a group of archaeologists are excavating the local ruins, with the unofficial assistance of one Brigadier Lethbridge-Stewart, enjoying his retirement in the form of a holiday. And, into the middle of all of this comes the Doctor and Evelyn Smythe. The initial investigation of the local fogou (an underground structure who’s purpose isn’t known in modern times) and some of its strange stonework – stonework that shouldn’t be found on Earth – leads to the pair to the local archaeological society, just as a backpacker is murdered on the moors. Following on the heels of the superb The Marian Conspiracy, Colin Baker and Maggie Stables showcase their incredible chemistry from the very beginning. Evelyn shows historical interest in the site, and the Doctor is happy to show off his own knowledge. It is simply amazing how Colin Baker has made this audio portrayal of the Doctor his own, and one can’t help but wonder how television history could have been different if he had been given an honest chance. He shows impatience with UNIT bureaucracy and thick-headed scholars (with a nice scene of bluster towards the Professor) , but when asked to admit he’s wrong, he does what any good man does – settle things with a nice cup of tea. Evelyn Smythe slides right into companion mode, not only in terms of dialogue and chemistry with the Doctor, but also in terms of sneaking off by herself when specifically told not too, getting captured, escaping, being captured again, and then once more escaping only to be re-captured! But it’s all done with such charm and a stiff-upper-lip that marks her as unflappable. And what can we say about Nicholas Courtney that hasn’t already been said? His performance here is another brilliant case of Big Finish bringing back classic characters and letting the actors/actresses breathe new life into them. Lethbridge-Stewart defines courage, honor, and class, all done with just a touch of wry humor. The meeting between the Brigadier and the Doctor is absolutely amazing, and brought such a smile to my face. Not only does the Brigadier shine with the Doctor by his side (and vice-versa), but when it’s time for UNIT to get involved, the authority and command confidence shines through, with a particular chewing out of another soldier worthy of note. It more than makes up for the Brig’s valiant-but-futile turn in Minuet in Hell. It’s a shame that we really won’t see that much of the Brigadier throughout the Big Finish catalog, and sadly, Nicholas Courtney passed away in 2011. The supporting cast more than rises to the level of Baker, Stables, and Courtney. Toby Longworth pulls double-duty as both the serial’s villain Sancreda and the archaeologist Professor Morgan. Morgan is grumpy, frustrated with the Doctor’s presence, and can’t believe what’s going on around him without a scientific explanation. And Sancreda immediately is established as a motivated, petty, angry villain, who dominates the third and fourth episodes with a flourish of terror. His motivation is understandable, and the truth of his abandonment hits home even as it hardens his anger. Longworth will show up again and again with Big Finish, and I can’t wait to see what else he’s capable of. James Bolam and Susan Jameson deserves praise as well, as Sir Archibald Flint and Mrs. Moynihan. Both have dealings with Sancreda, but for different reasons. When the devil comes calling for their due, the actors have developed the characters’ final fates are both horrifying, yet elicit a twinge of sympathy. Kudos go to both the script writer and director for this serial, Nicholas Pegg. The script is brisk, doesn’t get bogged down, and Evelyn’s repeated kidnappings do not come off as an overused plot device, but more of a learning experience for the history professor. The sound effects, including the alteration of Sancreda’s voice, are well done; wind blowing across the moor, the Doctor knocking artifacts about as he bungles through the lab, and so forth. The climax of the fourth episode (and the whole serial) is simply incredible, very well done and a throwback to (once again) the old serials where the viewer sat on the edge of their seat wondering how the Doctor was going to get out of this one! To say more is a bit of a spoiler, but I may or may not have fist pumped and had a smile on my face when the day was saved. Final Synopsis – The second Six/Evelyn serial, with a strong assist from the Brigadier, will impress new listeners, bring back memories of classic serials to old listeners, and bring forth both a chill and a smile. 5/5. Next up – When a teleportation accident goes badly wrong, Nyssa finds herself stranded on the freezing slopes of the Swiss Alps in 1963. But is it mere coincidence that she finds shelter in a snowbound school haunted by a malevolent poltergeist? Peter Davison is the Doctor in…Winter for the Adept. This entry was posted in Big Finish Review and tagged Big Finish, Brigadier, Colin Baker, Doctor Who, Evelyn Smythe, Sixth Doctor, TARDIS. Bookmark the permalink.